A Yale-led research group has created the most detailed maps yet of a vast seedbed of stars similar to Earth's Sun. The maps provide unprecedented detail of the structure of the Orion A molecular cloud, the closest star-forming region of high-mass stars. Orion A hosts a variety of star-forming environments, including dense star clusters similar to the one where Earth's Sun is believed to have formed. "Our maps probe a wide range of physical scales needed to study how stars form in molecular clouds, and how young stars impact their parent cloud," said Yale postdoctoral associate Shuo Kong, first author of a study about the group's research that has been accepted by the Astrophysical Journal Supplements. The research team includes astronomers from institutions in the U.S., Chile, Japan, France, Germany, Spain, and the U.K. The team's principal investigators are Yale astronomy professor Héctor G. Arce, ALMA Observatory scientist John Carpenter, and Caltech astronomy professor Anneila Sargent. Kong said the team constructed its maps of the Orion A cloud by combining data from a single-dish telescope and an interferometer. The Yale Center for Research Computing assisted in handling the large dataset and producing the images. The dataset and maps are collectively known as the CARMA-NRO Orion Survey. The name refers to the Combined Array for Research in Millimeter Astronomy (CARMA), an interferometer that was located in California, and the Nobeyama Radio Observatory (NRO) telescope, in Japan. In addition, the maps will help researchers calibrate star formation models for extragalactic studies. "The data we provide here will benefit research on a broad range of evolutionary stages of the star formation process and on the environment stars form," Arce said. Yale graduate student María José Maureira is also a co-author of the study. "The combined observations are a great help for astronomers seeking to understand how fast and efficiently stars form. 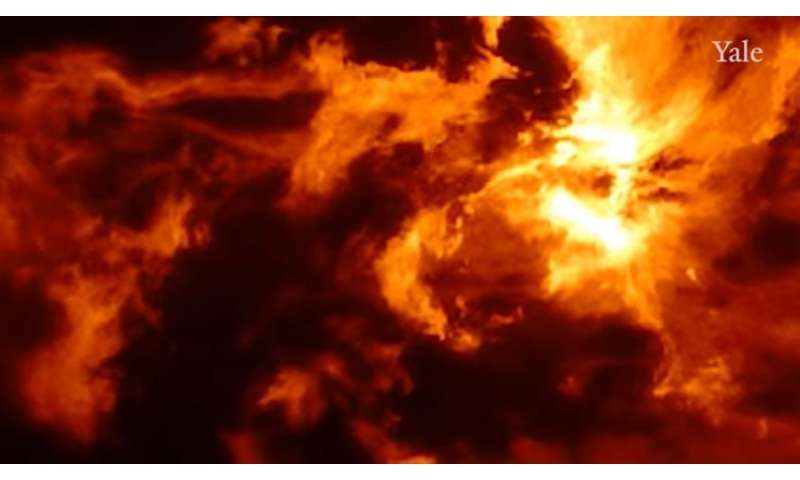 For example, their maps show the energy released by high-mass stars has a strong impact on the cloud environment," said Glen Langston, program director at the National Science Foundation. Only in the befuddled minds of wooists who simply don't understand the relevant science. Everybody knows gravitational collapse is the only way to get enough material together at a high enough density to form a star, @cantthink69. Everybody but you, that is. You old guys are really, really dumb! Yeah, they all come from fusion and magnetism. Oh, wait, you don't "believe in" fusion, right? @cantdrive explain to me how the electromagnetic force would clump matter together for star formation. Only opposite charges attract. Oh, wait, you don't "believe in" fusion, right? You like the strawman logical fallacy almost as much as jonesdumb. Well, you previously derided the idea that solar fusion is responsible for the heat of the Sun, @cantthink69. You claim it's from mysterious electrical currents that can't be detected. Doesn't sound like a strawman to me. Sounds like you said something else that's stupid, as usual, and are now trying to wriggle your way out of it, as usual. Clearly this is absolutely incorrect. Just look at how lightning occurs in clouds, if your comment was correct then there would never be the possibility of lightning discharge as there would never be a build up of charges to reach the voltage potential of the breakdown process. Yeah, it goes from negative to positive. Which can be seen by instrumentation, and has been, and is well documented. Care to try to make up any more Thunderdolts BS and sell it here? Oh, wait, of course you will. You'll just ignore this or make up a conspiracy theory about how all the evul siensetis are in a ginormous cunspirasy against the Thunderdolts. I derided the guess that the Sun creates all of its heat in the core due to fusion occurring there. numerous times as the correct process to explain fusion and a better model to achieve fusion power as a power source. I agree with the EU consideration that fusion is occurring on the surface of the Sun within plasmoids. And I have shown how The Safire Project has experimentally shown radiation trapping by electric double layers which solves jonesdumb contention that we'd all be fried if it were occurring on the surface. The standard solar theory is a total and utter failure which has not predicted accurately any aspect of observations of the Sum. Only after a build-up of like charges to achieve the required voltage you moron. Only by ignoring the evidence. You're lying again, @cantthink69. Spurious link that has nothing to do with the subject at hand; a clear strawman argument. Yes, after being built up by the updrafts and downdrafts common in thunderstorms, which work just like a Van de Graaf generator everyone but you saw in high school science class, since you didn't attend high school. Speaking of morans \sarcasm. Obviously the siense techers are in legue with teh evul siensetis against the Thunderdolts.